Pieter Thijs (Thys), Flemish painter. In 1644-45 he became a master in Antwerp s Guild of St Luke and from c. 1647 worked for Archduke Leopold William in Brussels and the House of Orange in The Hague. He executed allegorical and mythological compositions for both courts and was also active as a portrait painter (e.g. Archduke Leopold William, Vienna, Kunsthistorisches Museum). Later in his career Thijs concentrated mainly on religious compositions for Antwerp monasteries and numerous churches in smaller towns and villages in Brabant and East Flanders (e.g. Sacrifice of Isaac, Antwerp, S Jacob). In addition, he painted mythological scenes and portrait commissions for individuals and the art trade in Antwerp. From the outset, Thijs was greatly influenced by the later work of van Dyck. This may be related to the fact that his early patrons were rulers whose taste was formed by van Dyck s refined courtly style. Other possible influences include the work of older painters such as Thomas Willeboirts Bosschaert (1614-54) and Gonzales Coques; both artists were among the earliest followers of van Dyck, and they were also Thijs s predecessors at the courts of Brussels and The Hague. After c. 1660 Thijs combined this courtly style with a somewhat theatrical decorum, which clearly shows the growing contemporary predilection for academic and classical compositions. In his portraits of prominent clergymen and citizens from Antwerp, Thijs also paraphrased formulae from van Dyck s portraits of his second Antwerp period (1627-32). 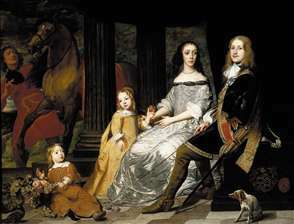 See more details about "Portrait of Philips van de Werve and His Wife"